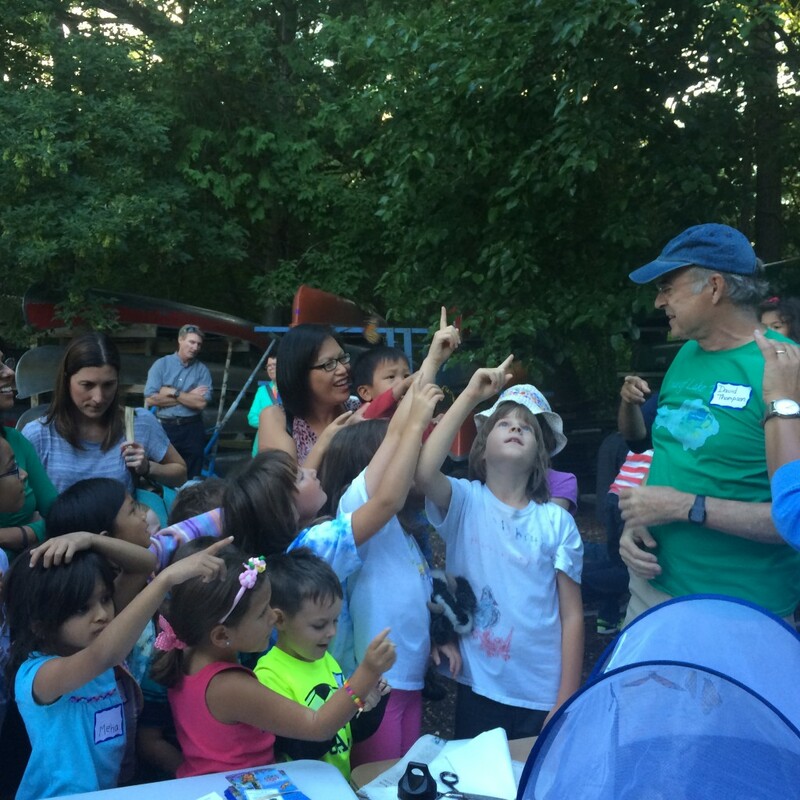 Last Thursday evening was the last Science Thursday of the season at Wingra Boats. Susan and David presented about Monarch butterflies and Milkweed plants to an enthusiastic group of kids and their parents. After talking about butterflies, their life cycle and why they are threatened we got to the fun part, David has been raising monarch caterpillars at home as part of his effort to start a Earth Leadership program for kids. This program that he has developed involves kids in finding monarch butterfly eggs on milkweed plants and bringing them home to hatch into caterpillars and raise into adult butterflies. Caterpillars outside are at high risk for being eaten or attacked by a predator so raising them indoors is a way we can help them have a better chance at survival. The best part of raising the caterpillars is that after they form their chrysalis and then emerge you get to release them into the wild! 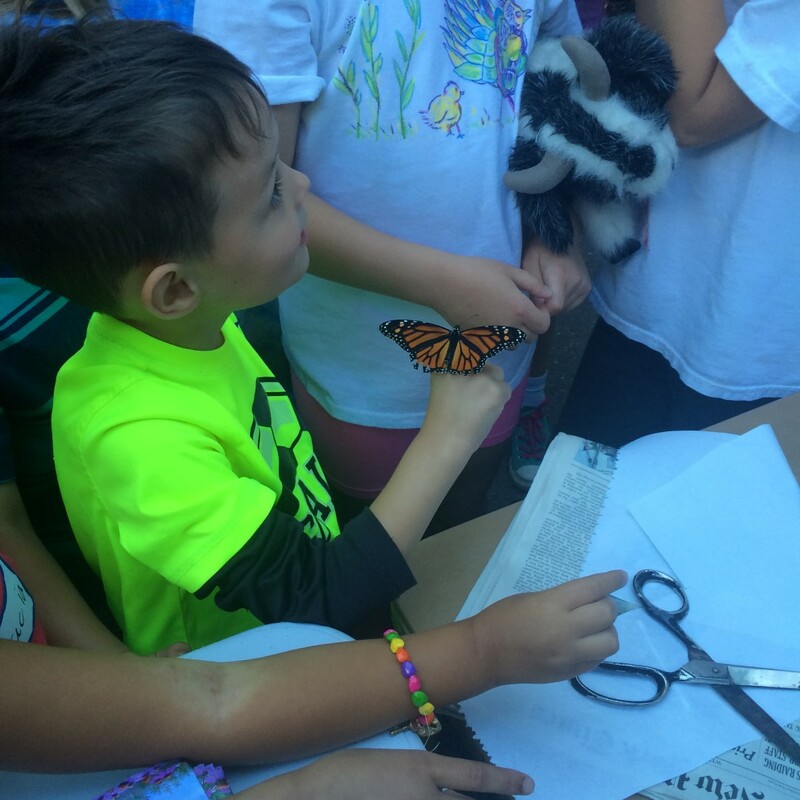 We released 5 or 6 adult monarch butterflies on Thursday evening, and as shown by the picture above it was a huge hit with the kids. If you would like more information about how your child can be involved please email davidthompson20(at)aol.com. Monarch butterflies are threatened by a variety of issues and two ways that you can help are to minimize your usage of chemicals such as pesticides and herbicides in your yard and also by planting Milkweed plants. Monarch caterpillars can only eat the leaves of milkweed, nothing else, so if there is no milkweed we won’t have any Monarchs. Right now at Wingra boats there are several flats of Common Milkweed and Butterfly Weed available for anyone to take and plant at home or anywhere else that you can think of and get permission to plant. You can take as many plants as you like while supplies last! Helping Monarch butterflies helps Lake Wingra, native plants like milkweed and other butterfly nectaring sources are better at capturing stormwater runoff than traditional lawns and minimizing chemical usage is good for the lake and good for everyone living in the watershed as well.